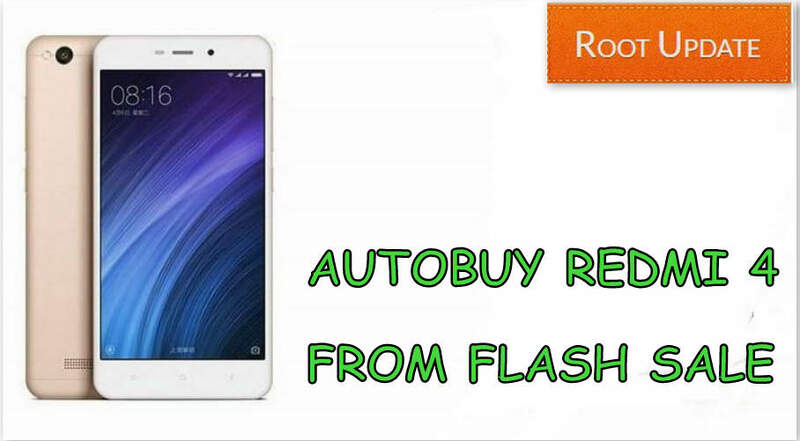 Script to Autobuy Redmi 4 From flash sale , Automatically Add Redmi 4 From Amazon flash sale in Cart, How to Autobuy Redmi 4 from Mi and Amazon Flash sale : Alright, So as you might already know about this, but in case you don’t for some reason, then Xiaomi has recently launched their new Lower Budget Smartphone for those who are very low on budget and still need a decent Smartphone that can serve them better in this Smartphone Era. In case you have not recognized, here we are talking about the new Redmi 4 which has been recently announced by the Company in Indian Markets. You might want to get your hands on the device, but Unfortunately Xiaomi has decided to go with”Flash Sale” as usual. in case you don’t know what a Flash Sale is then it is an Online Sale in which there are a limited amount of Devices up for grab. flash Sale usually ends within seconds and that’s the reason why most of the Peoples are not able to get their hands on the Device. But you guys don’t need to worry as root update is here to save you guys. we are here with a guide on\ How to Autobuy Redmi 4 from Amazon and Mi. But Before getting straight let’s take a quick overview over Specs of the New Xiaomi Redmi 4. Now Let’s start our guide on How to Autobuy Redmi 4 on Amazon and Mi. Keep all you Accounts (Amazon and Mi) ready before the sale. Save the details like Address, Name, and other Details. Also, keep login into your Account for a faster Checkout. Synchronize your time with that of Internet. To do this, Right click on the clock on your Desktop, then select Adjust date/time. Now In the popup window click on the Internet and Change Settings. Tick mark “Synchronize with an Internet Time Server”, click Update and OK. That’s it. Try to get the best internet connection that you can possibly can. In this trick to buy Xiaomi Redmi 4 from flash sale automatically, we will use a Script that will help you to automatically add the Xiaomi Redmi 4 in your cart. Okay now starting with the guide on How to Add Xiaomi Redmi 4 successfully to your Cart on flash sale. Log in to your Account 5-7 minutes before sale. Open the Page of your Desired Variant of Redmi 4. Right, Click anywhere on the Page and Select Inspect Element. Select Console Tab on top. Enter the Script according to your Smartphone and paste that in the console. Press Enter and the Script will do the Work. Once the Smartphone gets added to your Cart. Go to Cart and Checkout. That’s it, Once the Device is added to cart, Proceed to Checkout and Complete Purchase. That’s it, you have successfully grabbed Redmi 4 in Flash Sale. Easy? No. Well, in case you have any questions you can leave them in the comments down below. Why don’t you make scripts for Redmi official website. script for redme 4 16 gb black?